Rediff.com » Sports » Did Putin play a role in getting Russian judo team approval for Rio Games? Did Putin play a role in getting Russian judo team approval for Rio Games? The International Judo Federation -- which lists Russian President Vladimir Putin as its honorary president -- will allow the sport's Russian squad to participate in the Olympics, its head told Reuters on Tuesday. The International Olympic Committee has left it up to the world governing bodies of each sport to decide if Russian teams can go to Rio after the World Anti-doping Agency said there was a state-sponsored programme of doping in Russian sport. Judo joins tennis as sports that have decided to allow Russian competitors to participate. Track and field, swimming and canoeing have so far said Russians will be banned. 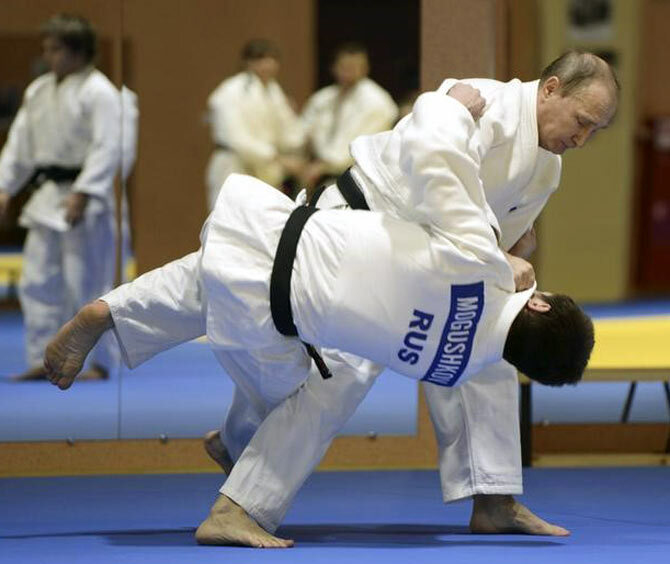 Putin is a judo blackbelt and frequently shown on television practicing the sport. In addition to Putin's honorary role at the federation, one of his closest friends sits on its executive committee. Federation president Marius Vizer said neither factor played any role in its decisions. Asked in a telephone interview with Reuters about the 11 Russian judo competitors -- seven male and four female -- who have qualified for the Olympics, Vizer said: "They will go to Rio." "All those athletes have been tested starting from September last year until the end of May, on many occasions, at many international judo events, not in Russia, abroad from Russia," Vizer said. "There was no punishment, no negative evidence, we don't take into consideration any analysis or tests made in Russia, because for us it is not relevant." What's the easiest thing to win at Rio Olympics?